A good friend just bought a new house in a neighborhood that has yet to get the infrastructure for Charter or Frontier. He can’t hook up internet or phone from either of those two sources. It could be 6 months or more before any of those are available. He finally went ahead and had Dish hook up satellite so he can watch football and whatever else is on TV. He decided that, out of necessity, he would have to switch to another cell phone plan in the meantime since his iPhone 5 is his only phone for now. I had him come to my house and we logged into his T-Mobile account from my Mac and picked a pay-by-the-month plan that includes unlimited talk, unlimited text, unlimited data and up to 5GBs for a Hotspot. It is $80 a month plus about $5 tax. I am sure many people are spending that much or more for their monthly cell phone plan and maybe they don’t get as much? I got this friend hooked on Korean dramas (like me) and he figured he would be able to watch them on his iPhone, but not his 55˝ HD TV like he had been doing with the Roku before he moved. I reminded him that he had the Hotspot included in his phone plan and he should try using it. He would be able to watch on his iPad which is a lot bigger than the iPhone. He went into his Settings on the iPhone and turned on Personal Hotspot and was able to start watching Netflix and DramaFever on his iPad. He was very happy about that. I then suggested he ought to see if the Roku would also work with his Hotspot. He messed with it for a while and suddenly, his iPhone showed up as a WiFi source and he was able to watch on his bigscreen TV. He was even happier. We talked about it and figured that he should check his T-Mobile account often to see how much data was being used in the Hotspot since it was limited to 5GBs a month. After a couple of weeks, he reported that he had used practically no data on the Hotspot but on his regular Data, he was up to about 30GBs! I visited him at his house recently so he could demonstrate how well the Hotspot was working for streaming on the Roku/TV. While we were there, I opened my own iPhone 5s Settings and turned on Personal Hotspot and suddenly my iPhone was showing up as a WiFi source on his Roku screen! I was dumbfounded! After entering a password from my iPhone, we tried it out by playing part of a video on the Roku and it worked great! The reason I was so amazed is that a couple of months ago, I turned on Hotspot on my iPhone while playing around, and there was a message saying I had to get a cell plan that includes Hotspot to use it. I have an Unlimited data plan but no Hotspot plan. But now, all of a sudden I can turn on Hotspot and it works? When I got home, I started researching online and discovered that on any iPhone that has iOS8 or later, you can turn on Personal Hotspot in settings. Apparently, it works using your data plan and T-Mobile doesn’t even know I am using my data for a Hotspot. My friend, Ed also had recently updated to iOS8 and that is probably why his plan is showing he hasn’t been using his Hotspot at all even though he has been using the heck out of it! As for me, I have WiFi with my Charter Internet and I don’t need to use my iPhone as a Hotspot, unless the power goes out for a length of time. As for Ed, he is really benefitting from this new iOS8 feature and it came just at the right time. Ed has reported that using his iPhone as a Hotspot does wear down the battery faster, so he usually puts it on the charger when he is streaming videos to the Roku. I think using a lot of data on a cell phone does use more battery power because I notice when I am using even Audio FaceTime, my battery goes down a bit in half an hour of usage. 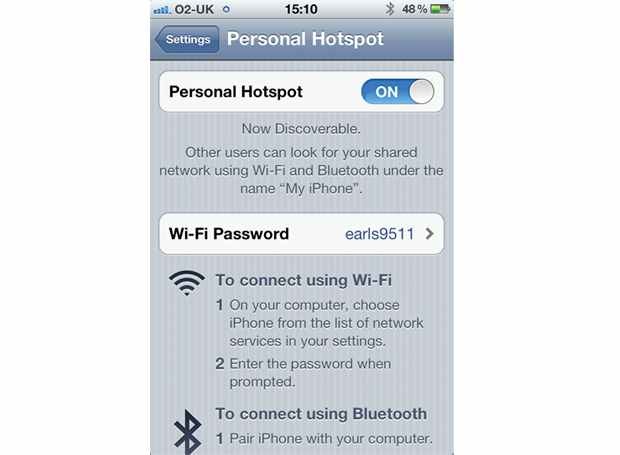 Personal Hotspot is one of the new iOS8 features and it is worth getting. Republished with permission from the Mid Columbia Macintosh Users Group.